Megan Rapinoe scored two goals and helped set up three others in the U.S. women’s soccer team’s 6-0 rout of Mexico in World Cup qualifying. The U.S. women's soccer team aced its first test of World Cup qualifying, routing Mexico, 6-0, in the group stage opener Thursday night in Cary, N.C.
Fueled by coach Jill Ellis' decision to start playmakers Rose Lavelle and Lindsey Horan together, the U.S. attack flew out of the gates. The first goal came in just the third minute. Lavelle and Horan were involved in a 17-pass buildup that led to the finish. Mexico's defense briefly broke the move up at the edge of the 18-yard box, but an attempted clearance was blocked by Horan and Alex Morgan. Horan seized the loose ball and squared it for Rapinoe to finish from five yards. That was the only goal of the first half, but the floodgates opened in the second. Horan won a free kick 35 yards from goal just 22 seconds after the opening whistle, Rapinoe served it up, and Julie Ertz fought through the ensuing goalmouth scramble to slam the ball in. "When we went into halftime up 1-0, we knew that there was more to give," said forward Alex Morgan, who scored the first of her two goals four minutes after Ertz struck. "So, going out in the second half and getting that second goal right away, that really set the tone." Rapinoe set up Morgan's initial tally with a 57th-minute corner kick. Morgan ran through a hole in Mexico's defense to meet the ball and head in her 91st national team goal. "We couldn't have asked for a better performance," Morgan said. "To keep a clean sheet and get a ton of goals and involve everyone, it was just a good overall performance for us." Ellis eased off the gas pedal after that, withdrawing Lavelle and Kelley O'Hara for Carli Lloyd and Emily Sonnett. But the U.S. kept scoring. 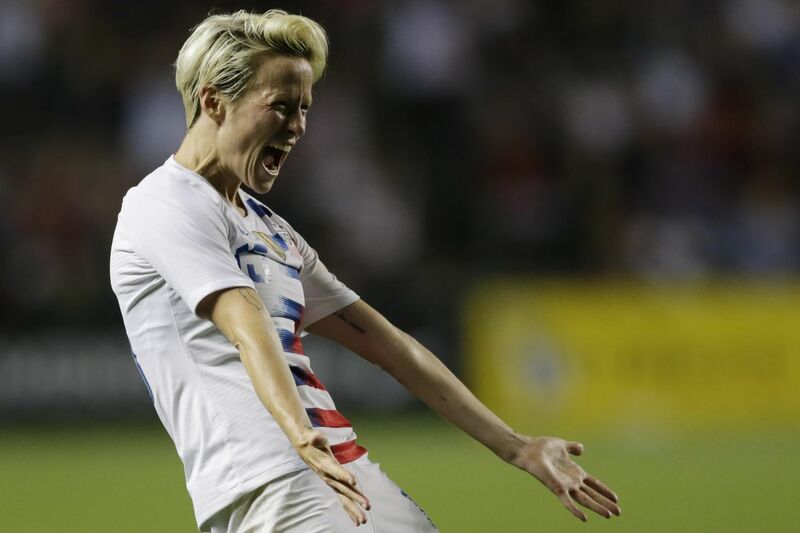 Rapinoe finished a broken corner kick play in the 70th minute, and Morgan scored after a marauding run by centerback Becky Sauerbrunn in the 80th. Mallory Pugh replaced Heath as the final substitute in the 77th minute. The U.S. next faces Panama on Sunday (5 p.m., Fox Sports 1 and Univision Deportes). Panama beat Trinidad & Tobago with surprising ease, 3-0, in Thursday's other group stage game. Trinidad finished fourth in the last World Cup qualifying tournament, but doesn't play often because of chronic under-funding by the country's soccer governing body. Panama's roster has 17 players under age 25, including 13-year-old reserve defender Sheyla Diaz.